The City of Regina is expected to look at a report on reducing speed limits in school zones at Wednesday’s meeting of executive committee. The city’s administration conducted an audit of all school zones in fall of 2018 to analyze overall safety. 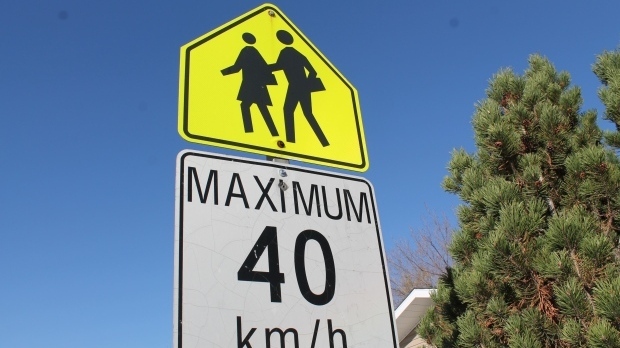 Following the audit, administration is recommending the speed limit be lowered to 30 kilometres per hour, effective from 7 a.m. to 7 p.m. in school zones and playground zones. Administration also found that at 40 kilometres per hour, the survival rate is higher for a pedestrian being struck at 30 kilometres per hour. The report also found a possible 30 kilometre per hour limit in Regina was on par with other comparable cities. Under the administration’s recommendations, school zone hours would also change from 8 a.m. to 10 p.m. to 7 a.m. to 7 p.m. to better reflect the time during the morning when students are being dropped off, while reducing the impact on motorists in the evening. Administration would also look at options to work with schools about the 7 p.m. end time in order to educate parents on the reduced evening hours. The report goes before executive committee on Wednesday and barring any changes resulting from the meeting, it will be brought before city council at a later date. If passed by council, the changes could go into effect in time for the 2019-2020 school year next fall.